Before we fly somewhere new we’re pretty guilty of trawling website after website looking for somewhere that’s a little bit quirky or a cute boutique hotel that has more life than your standard hotel but also doesn’t break the bank and of course has good reviews on places like Tripadvisor. We’ve been pretty lucky in the past finding some absolute gems that we’d definitely go back to, like our favourite place to stay in Madrid and a super swanky old newspaper printer turned boutique hotel we stayed at in Amsterdam. 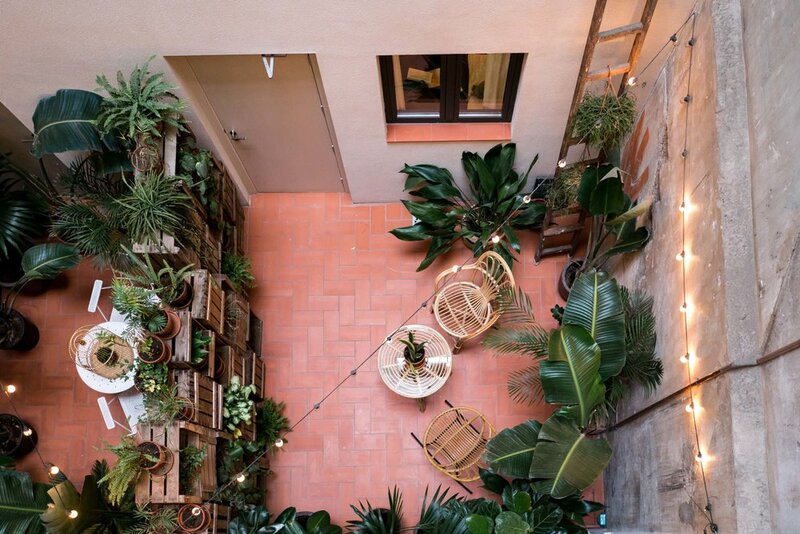 This time our travels took us to Magatzem 128 in Barcelona which was our home for a full week whilst we toured the city and attended OFFF Fest. As we were there for so long we needed to make sure it was pretty budget and at around £95 a night in a bustling hipster part of the city we did alright! Set in an old converted furniture warehouse the main feature that you can’t miss is the stunning glass atrium that takes pride of place in the centre of the hotel full of gigantic banana leaf plants & monsteras, literally any plant lovers dream. The rooms are basic but with an industrial chic feel featuring polished concrete walls, suspended drop lighting, big sliding doors and more subway tiles than you can shake a stick at. The only downside for us is that we found that if the rooms next to us were showering the noise was pretty loud but we were quite happy to ignore this for a cute room overlooking all the impressive plants. Each morning you can enjoy complimentary muffins, tea and coffee in the ground floor lounge area with a book from the shelf or whilst browsing the artwork that’s for sale. If you prefer you can take your coffee to go too which is pretty cute and handy if you’re in a rush. The location is perfect if you’re looking to be in walking distance from the Ramblas without being slap bang in the noisy hustle and bustle, and if like us you enjoy eating out at street food inspired restaurants and drinking in craft beer bars. We’d happily stay at Magatzem 128 again next time we visit Barcelona so give it a look if you’re flying out there soon!